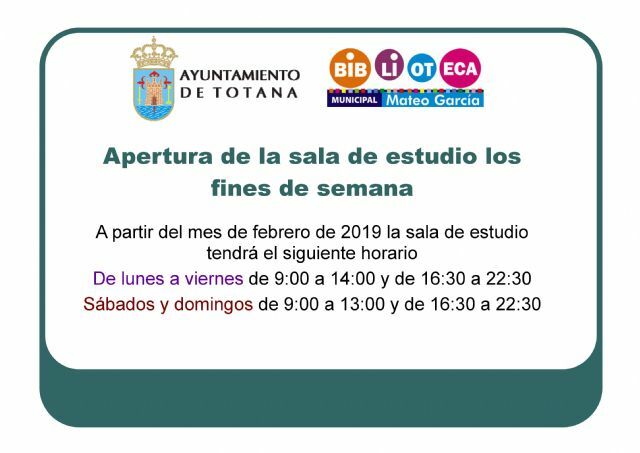 The Department of Culture of the City of Totana has decided to maintain the opening of the Study Room, located on the first floor of the Sociocultural Center "La Cárcel", during the weekends from this month of February in order to give continuity to this service and respond to the demands of users. although it has been decided to keep it on Saturdays and Sundays before the requests of the students. In this way, the Study Room schedule will be from Monday to Friday, from 9:00 a.m. to 2:00 p.m. and from 4:30 p.m. to 10:30 p.m.
and on Saturdays and Sundays, from 9:00 a.m. to 1:00 p.m. and from 4:30 p.m. to 10:30 p.m.